GO FAIR is a bottom-up, stakeholder-driven and self-governed initiative that aims to implement the FAIR data principles, making data Findable, Accessible, Interoperable and Reusable. It offers an open and inclusive ecosystem for individuals, institutions and organisations working together through Implementation Networks (INs). The INs are active in three activity pillars: GO CHANGE, GO TRAIN and GO BUILD. A socio-cultural change involving relevant stakeholders at all levels relevant for the flourishing of Open Science. Training the required data stewards capable of designing and implementing proper data management plans including FAIR data and services. Designing and building the technical standards, best practices and infrastructure components needed to implement the FAIR data principles. Through these three activity pillars, GO FAIR advocates for the FAIR data principles. 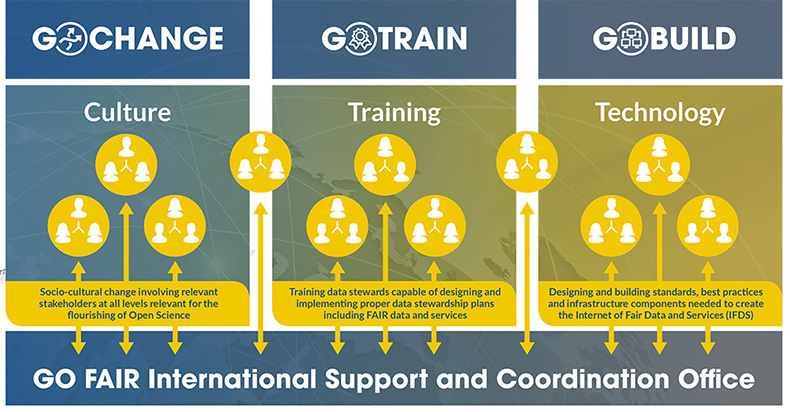 Furthermore, the GO FAIR Initiative will coordinate and contribute to the coherent development of the Internet of FAIR Data & Services (IFDS) through community-led initiatives in the three activity pillars. Just like the current internet, which has no single centralized governance, the concept of the Internet of FAIR Data and Services (IFDS) is based on maximum freedom of implementation for everyone. 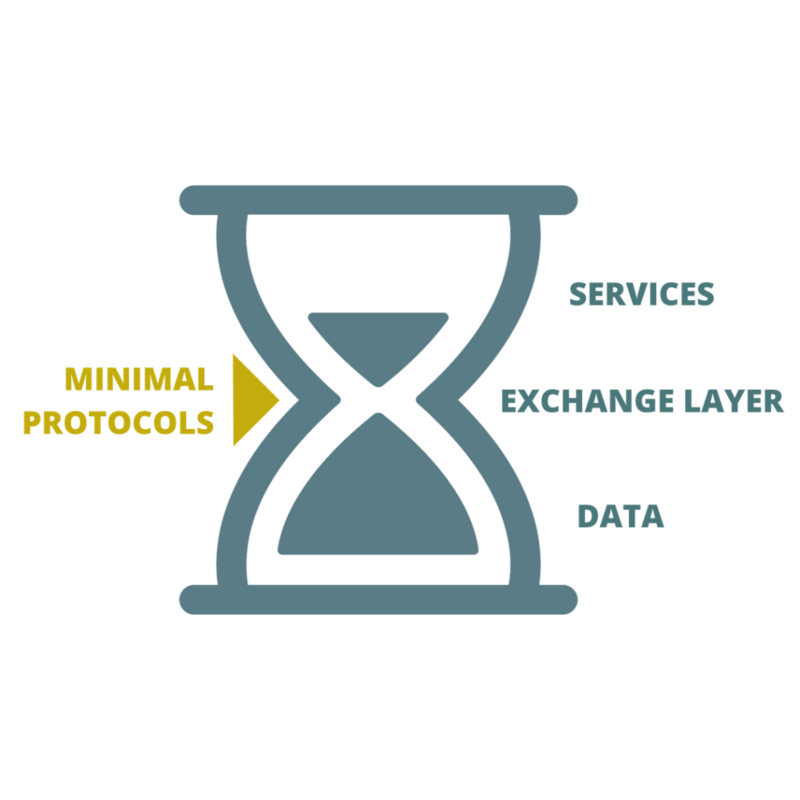 The dominance of a very limited number of private or public parties should be avoided by copying the internets ‘hourglass model’ of minimal, rigorous standards and protocols, such as http. This will allow open and common implementation and participation from different stakeholders. The scalable and transparent ‘routing’ of data, tools, and compute -to run the tools on- is a key central feature of this envisioned Internet of FAIR Data & Services. All kind of providers, both public and private, can start implementing prototype applications for the Internet of FAIR data and Services on the day minimal standards and minimal rules of engagement are released. In Europe, the United States, Australia and Africa, efforts to works towards an Internet of FAIR Data and Services (IFDS) are already under way. While keeping this global perspective, GO FAIR also contributes to the developments in the federated European Open Science Cloud (EOSC), which can be seen as the European contribution to the Internet of FAIR Data and services; Europe’s virtual environment for all researchers to access, store, manage, analyse and re-use data for research, innovation and educational purposes. • With a large degree of freedom regarding practical implementation. These recommendations are GO FAIR’s point of departure.